The steel-cutting ceremony for the first of two Costa Cruises ships to be powered by liquefied natural gas (LNG), the world’s cleanest burning fossil fuel, was held at Meyer shipyard in Turku, Finland. Set to debut in October 2019, Costa Smeralda will be the world’s first LNG-powered ship to be broadly marketed to consumers from multiple countries, including Italy, France, Spain, Germany and Switzerland. The ship’s name pays tribute to the Emerald Coast (or Costa Smeralda) in northern Sardinia in the Mediterranean, widely known as one of world’s most beautiful and famous destinations and natural environments. Construction work began today on Costa Smeralda after her steel-cutting ceremony held at the Meyer shipyard in Turku, Finland. 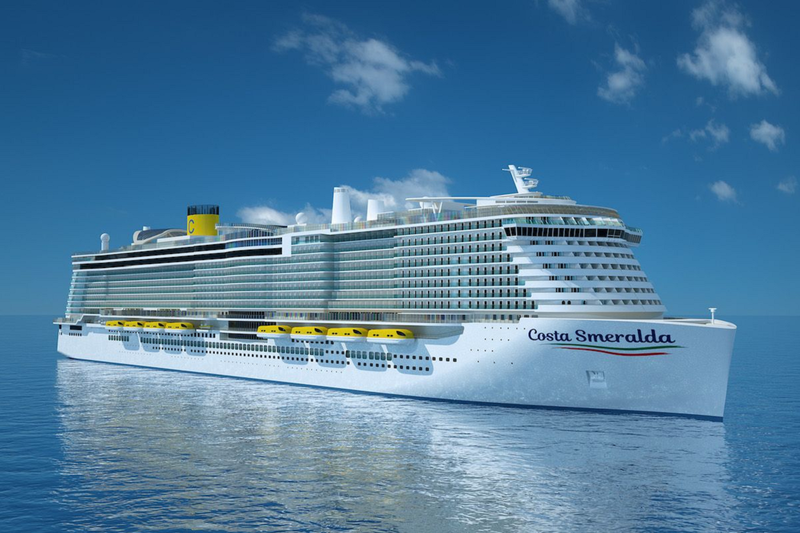 The new Costa Cruises ship will be the brand’s first ship powered by liquefied natural gas (LNG) and the world’s first cruise ship to be broadly marketed to consumers from multiple countries throughout Europe. Construction of the Costa Smeralda is part of a strategic plan from Carnival Corporation & plc – the world’s largest cruise company with 10 brands, including Costa Cruises – to build seven LNG-powered ships for its 103-ship fleet, starting in fall 2018 when the company’s German-based AIDA Cruises brand introduces AIDAnova, which will be marketed largely to German consumers. The two new Costa Cruises ships will be powered both in port and on the open sea by LNG, the world’s cleanest burning fossil fuel. LNG will be stored in special tanks on board ships and will be used to generate 100 percent of the energy required for navigation and onboard services, thanks to dual-fuel hybrid engines. The use of LNG is a major innovation in terms of environmental impact, as it will significantly reduce exhaust gas emissions, in particular sulphur (SO2), nitrogen (NO2), CO2 and particulate matter. “In the last two years, we have had a very intense design collaboration with our customer and the outcome is a really fresh and new design fused with the latest of technology. We are happy to bring our experience with building LNG powered passenger ships to bear. Today is a very special moment in shipbuilding, when all the ideas, creativity, technology and signature design that is going into Costa’s new ships, are finally starting to become reality.” – stated Jan Meyer, CEO of Meyer Turku.